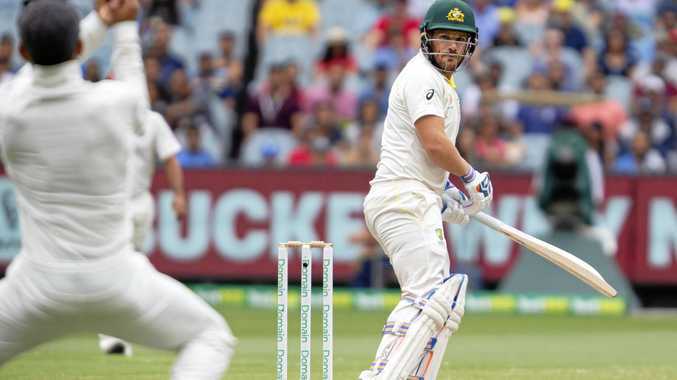 AUSTRALIA appear headed for an embarrassing losst in the third Test against India, having crashed to 5-138 at tea on day four after being set a target of 399 at the MCG. Jasprit Bumrah, enjoying the most productive Test in Australia by an Indian paceman, continued to create carnage as the tourists surged towards a 2-1 series lead in Melbourne. The national batting crisis, exacerbated by Steve Smith and David Warner's year-long suspensions, has delivered India a golden chance to secure their maiden Test series win in Australia. A day after Australia's top six folded in collapses of 3-29 and 3-13, Aaron Finch again set the tone in another morale-sapping innings. Bumrah struck with his second delivery of the day, which Finch inexplicably steered straight to an ecstatic Virat Kohli at second slip. Marcus Harris was undone by the third delivery he faced from left-arm spinner Ravindra Jadeja. Usman Khawaja and Shaun Marsh, who scored 33 and 44 respectively, provided more resistance but were both trapped lbw in the post-lunch session. Khawaja and Marsh both unsuccessfully reviewed their marching orders, with the ball-tracking replay almost saving the latter and denying Bumrah his eighth wicket of the match. Mitch Marsh smacked Jadeja for a six but gave Kohli more catching practice in the covers. Travis Head, unbeaten on 29, took off for a suicidal single in the second last over before tea and would have been run out by a direct hit from Jadeja. Bumrah's match haul of 8-55 is the best effort by a touring paceman in Australia since Kyle Abbott claimed 9-118 at Bellerive in 2016, when South Africa stormed home by an innings and 80 runs to trigger immense change in Australian cricket. Chairman of selectors Rod Marsh stepped down and a new panel made five changes to the XI, and James Sutherland and Pat Howard admonished the players in the dressing room - an action Smith claimed this week had fostered a toxic culture of winning without counting the costs. Australia have already named a 13-man squad for the SCG Test, which would suggest Peter Handscomb is the only player in the mix for a call-up for the series finale, but selectors may yet opt for reinforcements. Earlier on Saturday, Pat Cummins grabbed a career-best haul of 6-27 before Kohli declared at 8-106 after India added 52 runs to their overnight score. It is the first time since 2004 that India have declared twice in an Australian Test.